Do you still have nightmares about not being able to find your school locker and even if you do eventually find it, you can’t remember the lock combination and even if you do eventually remember it, the damn door won’t open? And does the Late Bell just keeps ringing and ringing? Yeah, me too. Before there was Middle School, there was seventh, eighth and ninth grades—Junior High. My reoccurring dream involves the putty-tan half lockers that lined the modern (circa 1967) Music Wing at CJHS. Unless you were coming up the stairs from gym, to get to your metal box with its built-in three-digit cipher, you had to veer off the first floor’s main drag, go down a few steps and then through a double set of double glass doors into the hallway. It got so congested; Safety monitors were assigned to enforce its entrance as One Way, going in. Like shiners into a minnow trap. So every time I see yet another teenager TV sit-com set in front of a well-lit bank of well-decorated school lockers, I cringe. 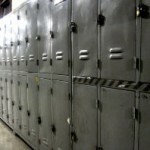 In junior high, getting to/fro one’s locker seemed like a crazy multi-floor version of musical chairs. By high school, you’d conquered class changes and could fit some make-out time between bells. But when you’re in seventh grade, it’s the stuff dreams are made of. Yet Lizzie, Hannah, Raven, Zoey, Cory, Carly and their cronies seem to spend an inordinate amount of school time giggling and gossiping, plotting and planning in front of their lockers. I clicked past Nick TV’s, iCarly, just in time to see three boys rolling around like a snake ball in their Middle School’s hallway. In my (not the) day, kids got suspended for that kind of behavior, not a laugh track. Fortunately Morgan’s never been taken in by the taking of artistic license. But more than one young homeschooler, especially, it seems, eight-year-old girls, has been brain-washed into believing that’s really what public school is like and beg to be a part of the show. Bratz dolls in training bras. Next post: What’s Your Favorite Word?